Today's bento is as requested by my kids. They love to watch Pokemon movie at home. And they have been talking about the new Pokemon character in the movie. So this morning, I got up early and made this new Pokemon character called Snivy (Japanese : Tsutarja). Kids can remember each Pokemon character's name, what they will evolve to, what type it is, and so on. I mean there are hundreds of the character in Pokemon. How come they know each one of them? Anyway, I think my boy will be pretty happy with the today's bento. 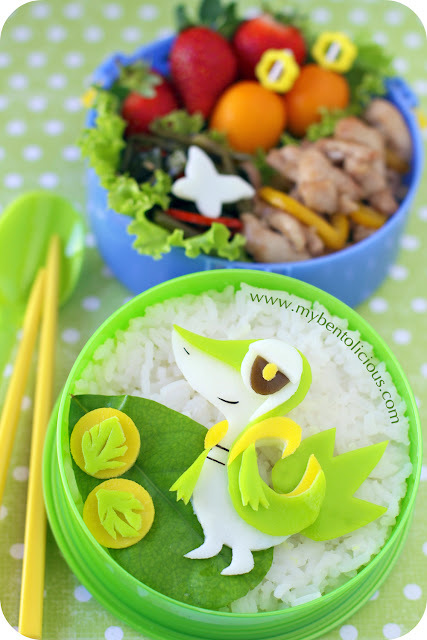 He asked me so many times to make Pokemon bento for him. Inside the blue round box : strawberries, kumquats, sauteed chicken with yellow paprika, and water spinach & soy bean paste stir fry. The water spinach was too dark green, so I cut out little butterfly to make a contrast. Today's food picks that I used were from a dearest bento friend, Megan. Thanks a lot Megan to send it all the way for me! She sent them to me last year and I kept it for so long in the box that I almost forgot to use it. Glad to use it to add bright yellow color in the box. oh i see, so this cute pokemon character called -Snivy, I saw this cute Dinasour/Lizard look alike character in Karenmama's blog. I always admire your cutting and eggsheet, it's always smooth and neat. Very neat and tidyly done! @prince n princess mum : Thanks a lot Kylie! the picks look great in this bento lia, so glad you like them. i am blown away by your cutting skills! snivy looks perfect, i had to look him up online, haha so funny what you said about kids knowing them all. fruits and veggies in the other box look so tasty. great bento! As alawys I love your sure, bright and delicate bento touch Lia! The details of this cute Pokemon character are so fun AND beautiful. WOW! Lia, this is superb! You are such an amazing mom. How lucky is your son to open this up at lunch and be happy? I know, I don't understand how our kids have the kind of memory that they do have. Weren't we like that too once upon a time?? Right? hehe.. I bet there's no character you can't make in this whole world. The foods in the blue container looks great as well! You make the most perfect egg sheet and cutting ever! @Angeleyes : I'm not too but my kids are hehehe ... You can make a request to J-Mama. Hope she can add those picks to her online store ;) Thanks a lot Alice for your kind comment!